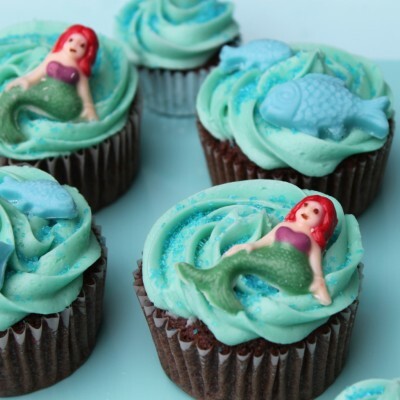 No matter which version of “The Little Mermaid” you prefer, if you love the story you’ll also love these adorable Little Mermaid Cupcakes. Since cupcakes are my favorite dessert, I couldn’t resist posting these. If I ever plan any kind of fairy tale themed party, you can bet these will be on the menu. Thanks to the mermaid’s resemblance to Ariel in the Disney version of the story, they’re easily recognizable. I am getting married this June. That being said, I understand why a woman would want to look like a princess on her wedding day. Childhood fairy tales tell us that princesses are usually beautiful and kind, and the Disney versions suggest they always get their happy endings. With this in mind, it makes sense that Alfred Angelo, the designer who created my wedding gown, has teamed up with Disney to fashion a line of Disney Princess inspired wedding dresses. In this collection, each gown is modeled after a specific princess. Most of the gowns are lovely. One of them, however, has some confusing associations. Most of the princesses included in the line make sense. Even in the original versions of their tales (or, in the case of Tiana, the story that inspired her tale) all of them got their happy endings. Yes, there was some violence; for example, Cinderella’s stepsisters got their toes chopped off. One of these princesses, however, is not like the others: The Little Mermaid. In the original Hans Christian Andersen version of this story, the princess many of us know as Ariel has anything but a happy ending. In fact, she fails to win the love of the prince and dies. I am aware that the dresses are specifically based on the Disney versions of these tales, but the connotations from the original story still exist. 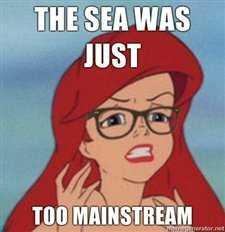 Do so few people know the original version that they actually want to look like the Little Mermaid on the day they get married? If they do know the story, why do they want to look like someone who is unloved and dead? Frankly, I’m a little shocked and a lot confused. Despite this, many of the dresses are lovely and not bewildering. Click here to see the full collection. Many fairy tales started out as grisly stories containing deaths and violence. The versions most people are familiar with today, however, are the heavily edited Disney-fied ones that can be seen in a plethora of animated film, in which the villain meets a just (albeit often nonviolent) end, the prince and princess get married and, perhaps most importantly, all the main characters survive. Although it’s the nature of fairy tales, as a genre that was long sustained by word of mouth, to evolve over time, the comparison between the Disney versions and the originals is fascinating. Maybe that’s why I always love to see someone give the universally recognizable Disney girls a makeover. This series by artist Jeffrey Thomas is one of the best examples of that I’ve seen. Snow White is my favorite, but they’re all fantastically grim. Ariel comes in at a close second, and Jasmine and Rapunzel are vying for third. Not only does the artist create these gorgeously dark fairy tale images, but he makes creepy story profiles for each princess. What’s not to love? Snow White is my favorite of Jeffrey Thomas' twisted princesses. To see the rest of this amazing series, check out Jeffrey Thomas’ gallery on Deviant Art.